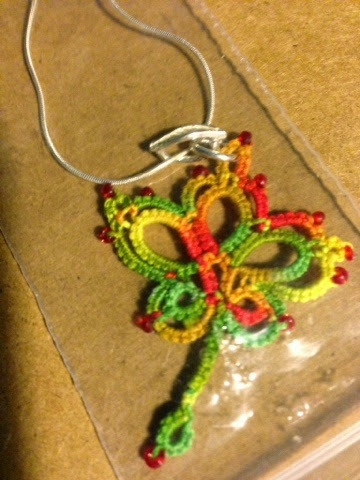 Sue Anna's Blog: Finished a tatting order. My adventures in life and the love of thread! All of these patterns are from Marilee Rockley's tatting books and patterns that can be found on Craftsy. The first picture is "Carnival " found in Tatted Jewerly purplished by Annie's Attic. The thread is Lizbeth size 20. Most of the beads came from Micheals. The leaf done in HDT Sugar Maple by Marilee. The pattern is found on her Etsy/Craftsy shop. 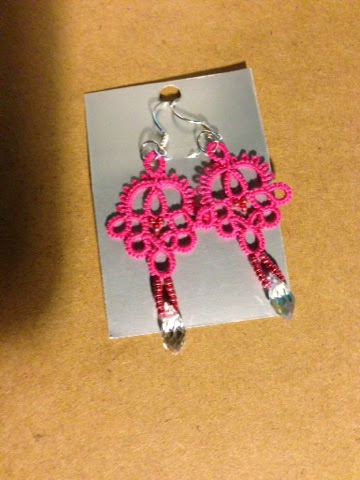 The pink pair are also from Tatted Jewelry and is called Keyed Up. The thread is also Lizbeth. 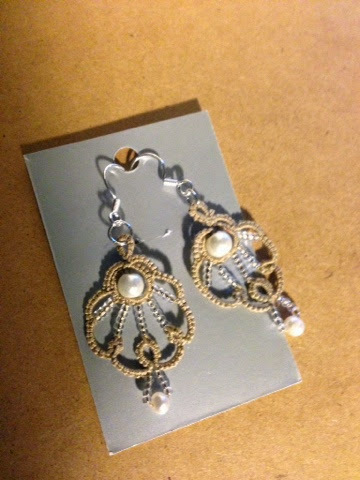 The tan pair is Glamore in Tatted Jewerly. 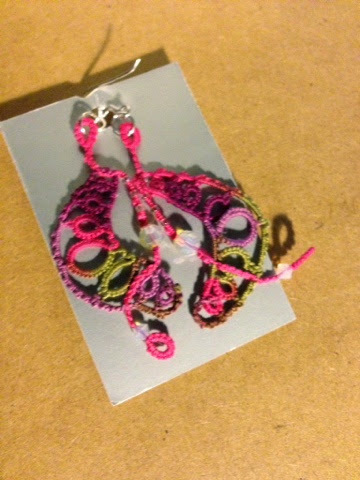 The pearls are from a bead shop in Brookfield, Wis.
Boomerang pattern is found in Marilee's new book Beaded Tatting Finery.The beads are opal and thread is Lizbeth. 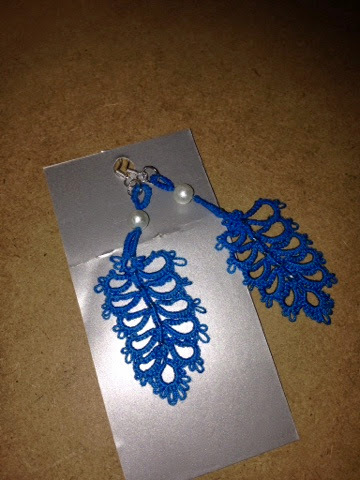 The feather earrings are also in Beaded Tatting Finery. Yes I have been busy. 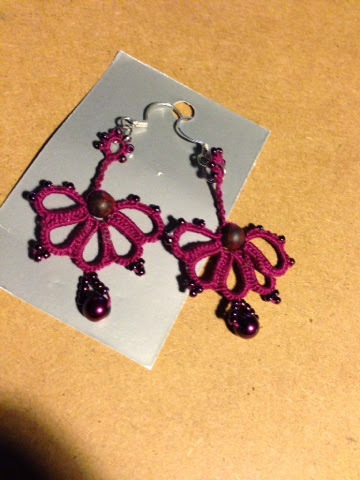 I wish there was lots of money in tatting. You are poorly paid for time it takes to do. But I had fun and the person who bought them as gifts loved all of them. How splendid to see you back blogging. You have been so busy that I'm exhausted reading how much you've achieved. Love them all. Very special gifts indeed! Lucky recipients! Beautiful work! Yes, it's a shame we can't enjoy what we do AND get paid properly for it! I tottally agree with you Sue Anna people have no idea the time you spend tatting these lovely items and they therefore do not pay accordingly. However, as you say you have fun making them and that is all we should ever focus on. Wow, you really have been busy! All the items look great. I'm glad you had fun making them and that you found a buyer who appreciates them. You Are a Daisy "You are just a sweet person. When a friend needs a shoulder to cry on, you are happy to offer yours with a box of tissues as well. Once in awhile, you wish you could be a little more dramatic but then sensibility sets back in and you know that you are perfect the way you are." I have been married for over 32 years with 3 grown children, one working in Alaska, and the other two still at home. I started tatting at 16 and some of my other hobbies include: Batik, tie-dye, cake decoration, candy making, woodwork, sewing, quilting, and knitting.